Our initial search for a trailer took us far afield. We hunted through classified ads, looking at trailers in the $1,000 to $2,000 range. 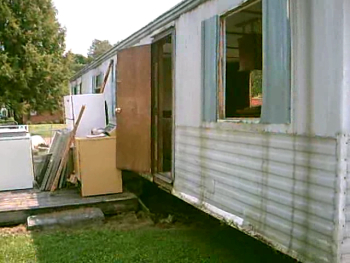 The world was astonishingly full of trailers for sale --- big ones, small ones, trailers reeking of cat pee, and fresh new trailers which seemed as fancy as any home I'd lived in. Then reality struck. The price of the trailer wasn't the big consideration; location was. We were going to have to hire a trailer-hauling company to transport our new trailer and those companies didn't come cheap, so the closer our find was to the farm, the better. We stopped reading classified ads and started rolling down back roads near our farm. Within hours, we stumbled across a trailer park fifteen minutes away and asked its proprietor if he had a trailer he was willing to sell for $2,000 or less. "You can have that one there for free," he said, pointing at a 1960s model, windowless and empty at the edge of the park. "If you haul it off." And that's how we found our new home. I like this series especially. This story is very entertaining. I'm glad you like it! It is more of a story than some of our other lunch time series have been. Stories are always fun. Now that's a good price! It's my kind of price --- free!